The planning seemed to have started the day the 2006 scooter rally ended. But one thing you can’t plan for is rain. The inaugural Rattle My Bones rally was a great success, in spite of being down on attendance due to the weather. The rally organizers reached out to all the members of the scooter community to make for a very fun weekend. The Happy Gnome was the starting point for the scooter scavenger hunt on Thursday. Friday, 4 separate rides were planned that all had a final destination of the Bedlam theatre where DJs and bands were playing. The automatic ride was one of the largest with almost 40 scooters ranging from 50 to 500cc. The Saturday morning big ride left from Yauruso’s, but was soon thinned out because of the rains leaving only a hardy 80 riders making it to Scooterville for lunch and the scooter games. The expanded Gymkhana course had a water splash and a “ring of fire”. Paint ball jousting is another new event that will need to be continued. Saturday night at the Triple Rock had more bands and two! scooters given away. 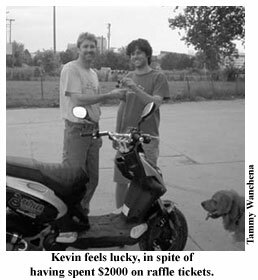 MMM’s Kevin Kocur won the hopped up Genuine Rattler 50 (70cc). Which I found out is the first new scooter or motorcycle he has ever owned. I have already heard murmurings of plans for next years rally and cannot wait. Anyone into scooters knows the kinship between scooters and Mods. Nattily dressed British kids on Vespas and Lambrettas, decked out with tons of mirrors and lights. Starr Cycle in Mankato, a Yamaha and Genuine Scooter dealer has modded out a Buddy with the requisite lights, mirrors andRAF stickers. 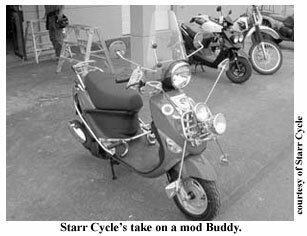 Starr Cycle is located on 169 in Mankato.They can be reached at 507-385-1990. I mentioned the GP800 when it was introduced in Italy a few months ago, and bemoaned that we won’t be seeing it because Gilera isn’t sold in the US. There are reports that the 839cc auto engine may be put into things such as the Piaggio MP3, and maybe some other models; which will be very interesting. Actual testing of the GP800 itself seems to be very positive. Bob Hedstrom, owner of Scooterville, has had his head spinning since hearing the news that the building they occupy will be torn down. He searched all over the metro before deciding on a new location, just down the street. Scooterville will be opening up their new shop in the old Easyrider’s location located just off of Cedar Ave and south of Hwy 94. Swayed by the large murals outside and Evel Knievel’s signature on the service entrance door; Hedstrom is very excited about the new shop. He is shooting for an opening the first week in October.